Hey there! It's Sunday and that means it is time for another challenge at the Paper Players! This week, Lesley is our hostess with this awesome sketch. This is a cool design...I had fun with it. I hope you will play along, too. The color combo came straight from the SU! Color Coach. If the Color Coach says it's a good match, then it is. It's like the "Godfather" of crafting tools. Haha! I actually attempted to use as many new products as I could on this card. It's kind of ridiculous.I love a card with lots of layers and his one is chock full of them! I am absolutely loving the new In-Colors...especially Summer Starfruit, which I wasn't so sure about, at first. The main image was punched (...and punched...and punched) from the Quint-Essential Flower image. I love stamps that coordinate with punches and this one happens to match up with 5 punches. Pretty fabulous, right? I also used a cool new tool called the Essentials Paper-Piercing Pack, to add those paper-pierced elements around the circle, This is seriously an awesome tool...it has templates to punch around a variety of shapes. 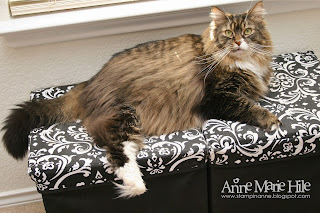 That has to be one of my favorite items from the new catty, for sure! The complete supply list is featured at the end of this post. I realized after I put this card together that I added the sentiment to the opposite side of the sketch. Ack!! Paper: In Colors DSP Paper Pad, Summer Starfruit, Primrose Petals, Basic Gray and Whisper White card stock. Darling card, Anne Marie. Beautiful colors and i like the different embossing ! A million layer card AND my favorite kitty? What a way to start off a Sunday morning! :) Love them both! And I agree on the Color Coach! I can't stamp without it! Yowza - layer upon layer - think I counted 16 without the ribbon and tags! Fabulous - I love each and every one! Oh, I love this---and I love Summer Starfruit too! I haven't had a chance to play with my punch pack yet, but hopefully this week---I am on babysitting vaca!!! Love this Anne Marie!! The colors are wonderful, must try that combo and all those layers are fabulous!! You rocked this sketch and now I must add that stamp to my next order!!! Absolutely gorgeous, Anne Marie! I love the texture, dimension, and that awesome color combination! Oh what a pretty pretty card!!! Love all the layers!!!!!! Beautiful job!!! 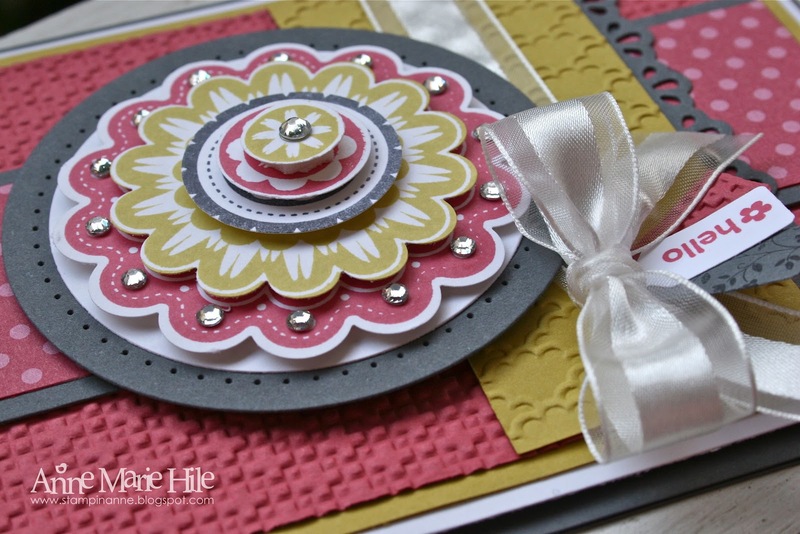 LOVE that layered flower and all of the wonderful texture and layers on this card! How much fun to play with all of those supplies! 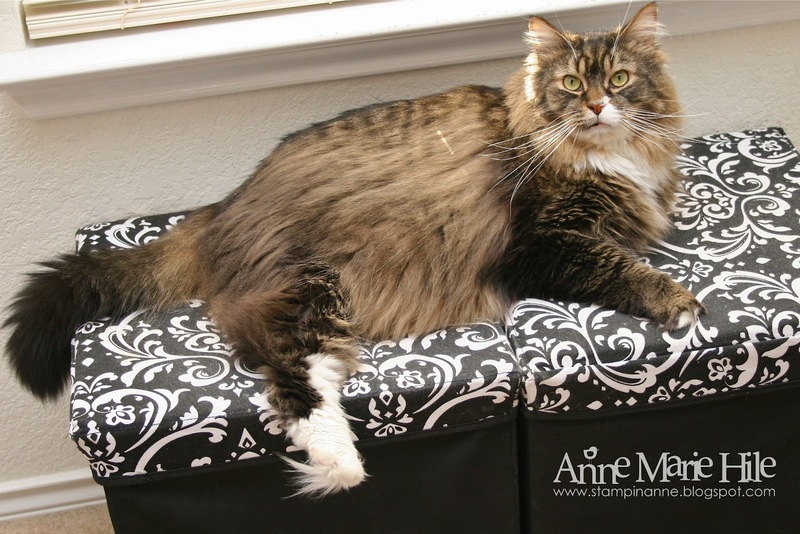 Your kitty is gorgeous! I just want to pick him up and snuggle! Looks like he has a pretty comfy spot to supervise everything! I wasn't as thrilled with Summer Starfruit at first either, but color combos like this just make me swoon. GREAT layerlicious card! 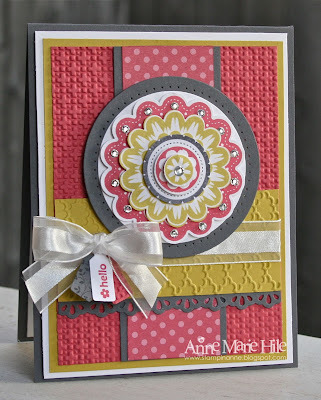 Your card is amazingly designed and beautifully layered! I love those tiny tag accents!